If you have been arrested and charged with a DUI in McDonough, it is critical that you select a knowledgeable and experienced attorney to address your case. It is important to hire a McDonough DUI attorney if you are facing a DUI – related charge or violation of your DUI probation. DUI can be charged when a person has a BAC (blood alcohol content) of 0.08% or higher during the operation of a motor vehicle. In addition, a person may face drunk driving charges if law enforcement believes they are a danger to society due to intoxication. At the Law Offices of Richard S. Lawson, their legal team has provided legal support, guidance and representation to individuals accused of driving under the influence and related charges. Do not hesitate to contact a skilled McDonough, GA DUI lawyer at their firm immediately to schedule a free case consultation if you or a loved one are charged with drinking and driving. They always provide aggressive defense on behalf of their clients who would like to make every effort to avoid a conviction and penalties that may include jail or prison sentence, community service, license suspension, installation of interlock device in motor vehicle, DUI school, alcohol counseling, probation and parole. In addition, if convicted of a DUI offense, a person can face loss of employment and higher insurance rates or loss of insurance. Please do not wait to protect your rights; contact a McDonough DUI lawyer at the Law Offices of Richard S. Lawson immediately. 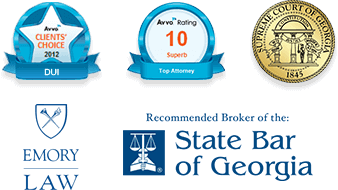 An attorney at our firm can review the facts of your case and answer any questions that you may have regarding charges. To avoid suspension of your driver's license, a letter must be sent to the Department of Driver's Services within 30 days of your arrest. If you don't do it, you will lose your driving privilege. Call immediately to assure that your right to drive is protected. Richard Lawson is a former DUI prosecutor who focuses exclusively DUI. Contact the legal team at The Law Offices of Richard S. Lawson immediately after any DUI arrest. Experience is the difference. The State has lawyers whose job it is to prosecute those charged with DUI. Trying to defend yourself against lawyers trained to prosecute you can make your situation worse. Hire a top-rated DUI lawyer who will fight to protect your rights.